How to manually change your status to 'Idle' in Google talk? How to manually change your status to ‘Idle’ in Google talk? Google Talk currently enables us to change our status to either Available or Busy. But sometimes, we might just want to take a break and appear to be 'away' to our friends even when we are not. The default time to become Idle in Google Talk is 10 minutes. But with the help of a nifty little app, we can change our status to Idle immediately. The application is gAlwaysIdle. It lets you change your status to Idle with just a click. gAlwaysIdle provides three options: Normal Idle, Always Idle, Never Idle. 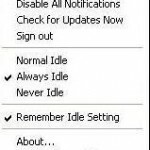 Never Idle: never lets Gtalk change your status to Idle, it overrides the 10-minute-no-activity Idle. It's just a 118 KB download, installs really quickly and you can start 'Idling' straight away. And we hope that Google adds the option to manually change our status to Idle and incorporates all the Google Talk, Labs Edition features in the next Google Talk update. Download gAlwaysIdle from here. If the above link does not work, you can also download it from gAlwaysIdleSetup.